Even Aaron Rodgers thinks the NFL is going too far with their new roughing the passer penalties, and he spoke his mind after the Green Bay Packers-Minnesota Vikings game was influenced by two such calls. The NFL has instituted a new rule this season in which players can be called for a roughing the passer penalty when they put all of their bodyweight onto a quarterback, essentially driving a man into the ground in a punishing fashion. "They're trying to think about the progress of the game and the safety and stuff, but it's still a collision sport, and those to me are not penalties," Rodgers told reporters on Wednesday, via ESPN. 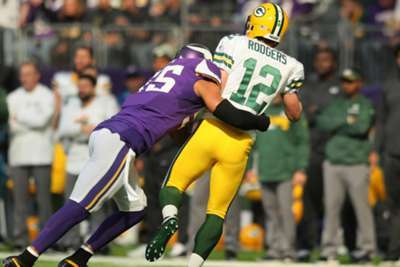 The rule very much came into existence because Rodgers suffered a broken collarbone in 2017 in a matchup with the Vikings when Anthony Barr fell on him on a hit. However, in the Packers and Vikings matchup on Sunday, Green Bay linebacker Clay Matthews and Vikings linebacker Eric Kendricks were called for hits which resembled the one Rodgers took last season, and even the Packers QB was not sure they should have been penalised. "What do you say to Clay? His head is out of it, his hand is on the ground, that's not roughing the passer," Rodgers said. "Same thing with Kendricks, what do you say to him on that? I didn't get up off the ground thinking, 'Where's the penalty?' I saw a late flag and couldn't believe there was a penalty on the play." The Packers had an interception taken away on the Matthews hit which would have likely ended the game otherwise. Instead, the Vikings drove down to tie the game 29-29. "I'm a traditionalist," Rodgers said. "I've watched the game and loved the game for a long time, and some of the rules I think help, but some of the rules maybe are going the wrong direction."